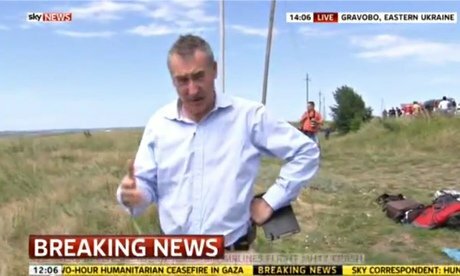 Sky News reporter Colin Brazier has admitted he made errors to handle Malaysia Airlines passengers’ belongings at the MH17 crash site in Ukraine. Writing in The Guardian, Colin Brazier said the crash site was unchecked and he was “free to walk around at will”. However, the journalist called his “gaffe” a “serious error of judgement” and said he cried on-air after seeing a child’s flask. More than 100 people complained to UK’s media watchdog Ofcom after Colin Brazier’s live Sunday lunchtime broadcast. The complaints are currently being assessed before the broadcasting regulator decides whether to launch an investigation. The report showed Colin Brazier picking up items from an open suitcase. He dropped them back into the luggage saying “we shouldn’t really be doing this I suppose, really”. A Sky News spokesperson said both Colin Brazier and the station “apologize profusely for any offence caused”. Writing his version of events following a vociferous backlash on social media, Colin Brazier said other journalists were acting on the freedom they had on the crash site, and “foolishly took that as a precedent”. Colin Brazier said the moment he realized he was doing something wrong “came too late” and just after the moment when he began crying, which was not picked up on poor quality replays of his report on the internet. “At the weekend I got things wrong. If there was someone to apologize to in person, I would,” he wrote in his article. Colin Brazier added his on-air apology was “only selectively quoted by those determined to see what I did as a powerful example of journalistic vulturism”. He said in a live and open-ended item from Ukraine, there was “no obvious frame of reference” but the crew chose “to avoid pointing a live camera anywhere a corpse might be seen”. Colin Brazier described how he reported from the site of another air disaster at Lake Constance in 2004, where “within hours police had sealed off a sterile area and no journalists were allowed in, while forensic investigators and recovery teams went in”. He described the Ukraine site as a lawless warzone where journalists where not kept at bay. Malaysia Airlines flight MH17 crashed over rebel-held territory in eastern Ukraine on July 17. All 298 people on board were killed.